Buenos dias mis amigos y amigas! I’m finally back home and ready to get my groove on in the kitchen once again. Please forgive me for my long absence. Mi mama, papa and I were in my homeland of Mexico for mi mama’s best friend’s wedding. 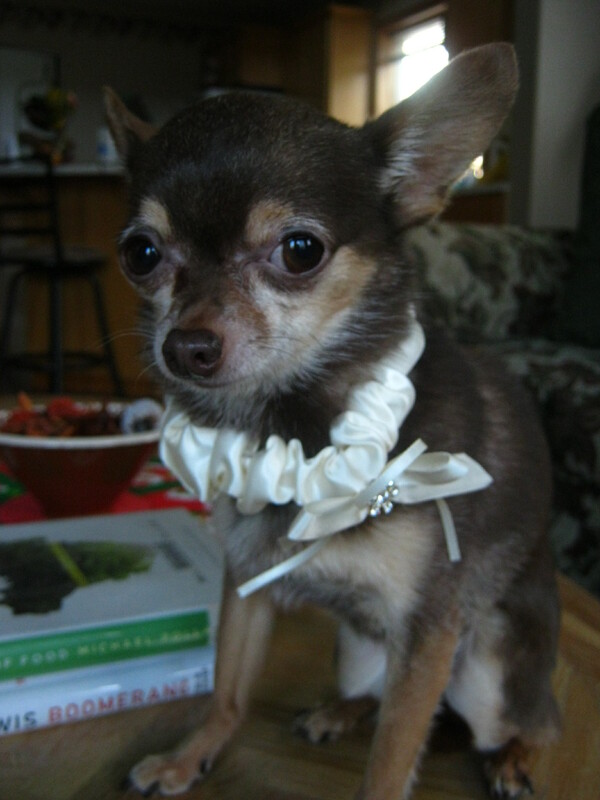 She was asked to be one of the bridesmaids and I was there to perform the wedding ceremony. Yes yes, in addition to all my other talents and professions, I am also an ordained minister and wedding officiator. Doesn’t pay very well but it still allows me to be the center of attention even on days when it should be the bride’s. Not to mention a good excuse for me to wear my tuxedo, top hat and tails. I’m fancy. So now we’re home, all my bags and suitcases are unpacked (thanks Papa) and I’m running around like a Chihuahua with his eyes popped out trying to figure out my menu for Christmas dinner. Hard to believe that day is almost here and even harder to believe that I don’t have everything already planned out given the fact that I’ve already made all the preparations for my 8th birthday party in Vegas and that’s not even until March. Is it wrong that I find my day of birth more important than Baby Jesus’s? Well even though I don’t have the whole menu planned out, I do know one thing for sure. 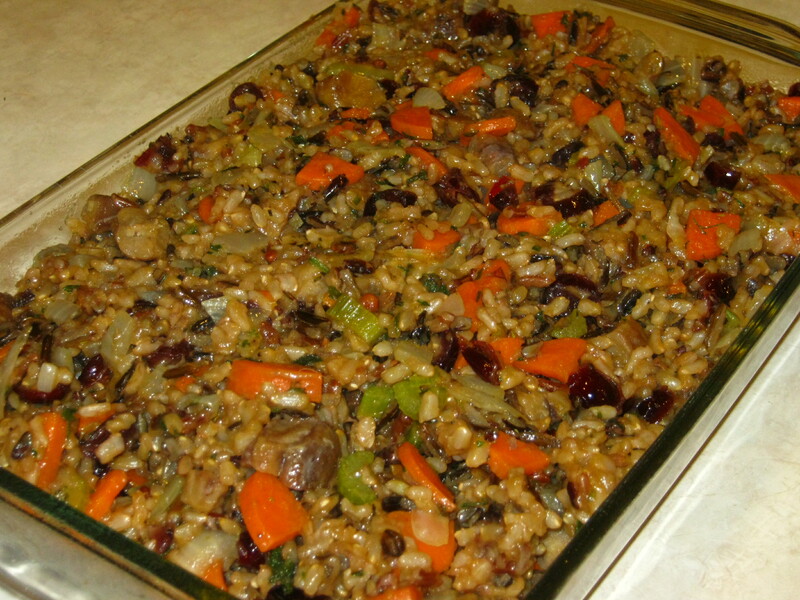 And that is I will definitely be serving this incredibly tasty Wild Rice pilaf as an accompaniment to whatever main dish I decide to prepare. Trust me when I tell you, this stuff is maravilloso. Mi familia had the pleasure of enjoying it this past Thanksgiving and have requested I make it again for our upcoming Christmas feast. Absolutamente! 1) Combine rice, broth and water in a medium saucepan. Bring to a boil. Cover, lower heat to a simmer and allow to cook 40 minutes or until rice is tender. Do not drain. Place rice in a large bowl and cover. 2) Pre-heat oven to 400 degrees. 3) Place cranberries in a bowl and cover with warm water. Allow to sit 20 minutes until softened. Drain cranberries and add to the rice. 4) Heat oil in a large skillet over medium. Add carrots, onions and celery and cook 15 minutes or until softened. Stir in herbs and remove from heat. Add to rice mixture along with chestnuts and salt and pepper. 5) Spoon rice mixture into a 13×9″ casserole dish coated with cooking spray. Cover and bake 10 minutes or until thoroughly heated. The great thing about this dish is if your main course ends up tasting like a burro’s caca, no one will even notice because this pilaf will be the star of the show. Now if you’ll excuse me, I have a few phone calls I need to make to some of my canine lady friends. Apparently this funny looking necklace I caught around my head at the wedding reception means I am the next gentleman to be wed in holy matrimony. I can’t wait til the bachelor party. You look so handsome! Don’t settle for just any girl, now. You deserve a muy bonita chica!